Sky condos by villette introducing a unique cascading architectural design that has never been seen before in Egypt. with exclusive apartments overlooking 35000 sqm Parks, Duplexes With 360 Degree View on Pocket Parks ranging from 156m. To 315m. Sky condos allows for breathtaking views of the sky above form the comfort of your home. Sky Condos phase One by villette introducing a unque cscading architectural design that has never been seen before in Egypt. with exclusive apartments and duplexes ranging from 156m. To 315m. sky condos allows for breathtaking view of the sky above from the comfort of your home. 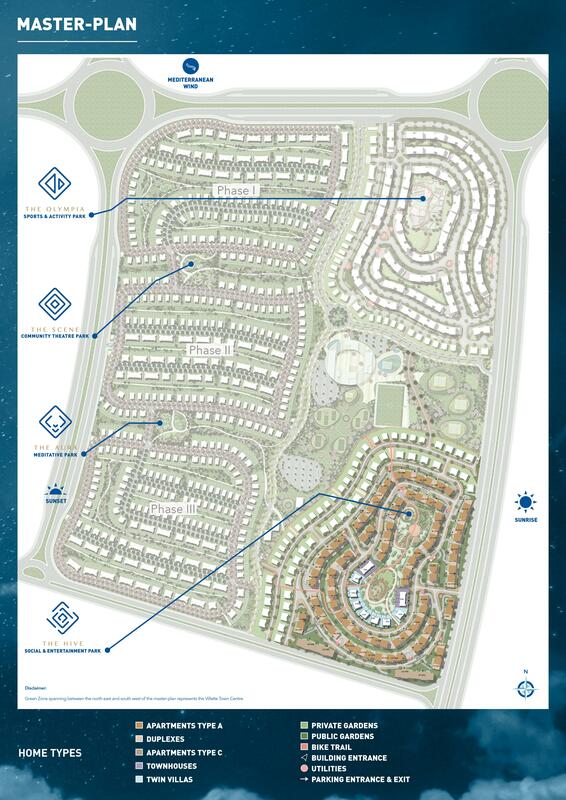 Master Plan of Villette is designed by American SWA, 301 Feddans 80% greenery 20% built area. • Gym • Tennis courts • Squash courts • Mosque • Spa • Kids playgrounds • Organic farm • Pharmacy • Laundry • Supermarket • Bakery • Medical clinic • Run and bike trails • Swimming - lounge pool - lap pool (junior Olympic) • Kids pool with water park • Church • Central green & central piazza • Area for flea market on weekends • Kiosks in outdoor communal spaces • Facility management offices • Nursery • Vet clinic • ATM centre. Sodic have also created 4 large parks (each park is 90 meters x 90 meters), the 4 parks are linked with jogging trails and bike trails. a 30 acre clubhouse which is one of the biggest clubhouses in New Cairo (10% of total area). The clubhouse has an Olympic pool, leisure pool, tennis courts, football courts, multi-purpose courts, as well as some food and beverage outlets which ensures that the residents of Villette will find all the services and all their needs will be met. suitable and comfortable housing in Cairo. We have a large database of available properties for rent and sale with descriptions and pictures. Our clients are expatriates working in International Company, the American Research Center in Egypt, Alitalia, and many other International associations and have supplied them with classy villas and apartments. Please feel free to contact us if you wish to rent or buy an apartment/Villa in any of the upscale districts of Cairo. Please tell us your request: The required location, No. of Bedrooms, the duration of the rent, your budget and we will locate one suitable just for you. If you have a preference of style of furniture modern/classic/ or no furniture please state so in your request.